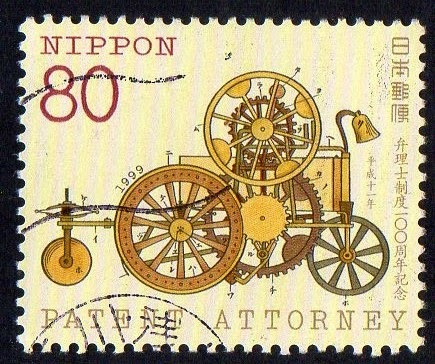 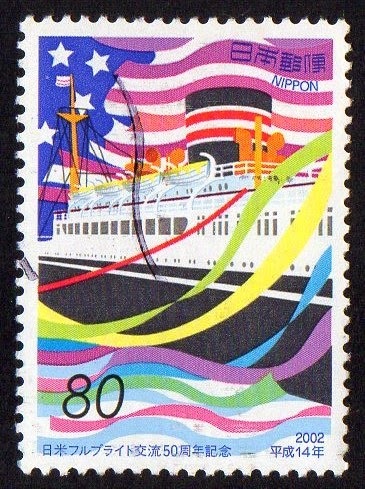 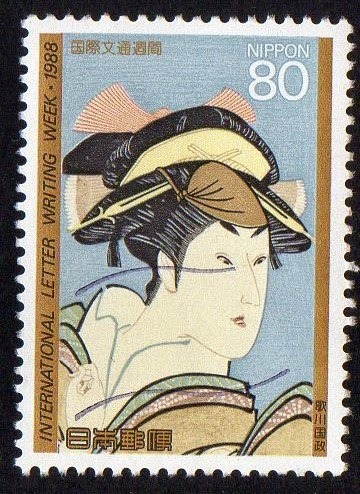 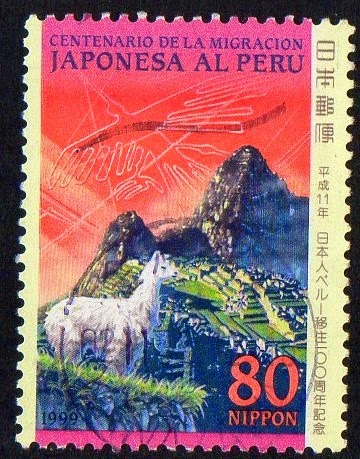 Today I will present some stamps from Japan.. beautiful stamps as usual..!! 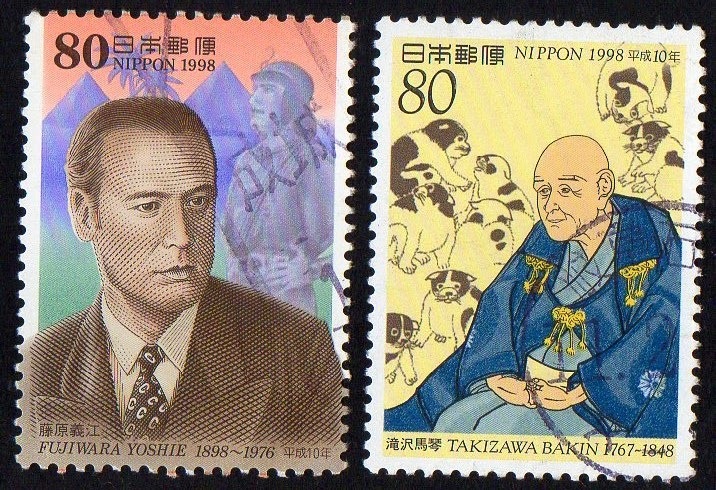 Japan Post has started in 1992 a series named "Men of Culture" that is repeated every year with new personalities.. 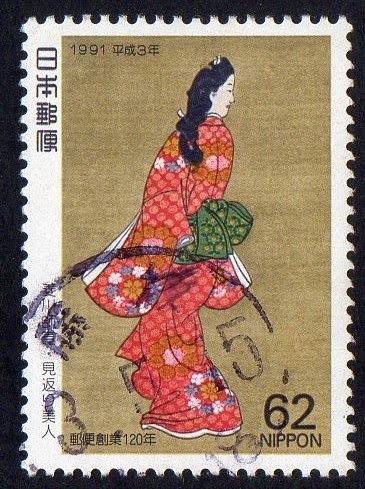 I just have Japanese stamps until 2004 , and at this time this series continue to have it's own place in the well structured Year plans of Japan Post..
As we know ,the Original "Men of Culture" Series (18) 1949/1952 is a series that all Japan Philately Fan want to have.. ( I never found this series selling anywhere...complete , of course..)..
Another beautiful series is the "My Favorite Songs".. 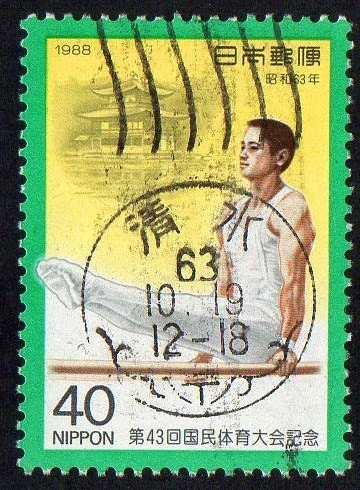 This series started in 1997 with the 1st and 2nd issues ; in 1998 there were 5 issues and in 1999 2... Each issue have 2 stamps ,so we have a total of 18 stamps ; the stamps represent each one , a different song and fractions of the musical notation appear in the inferior part of the stamp...When I finish these series I will present here in the blog.. 3 stamps missing!! 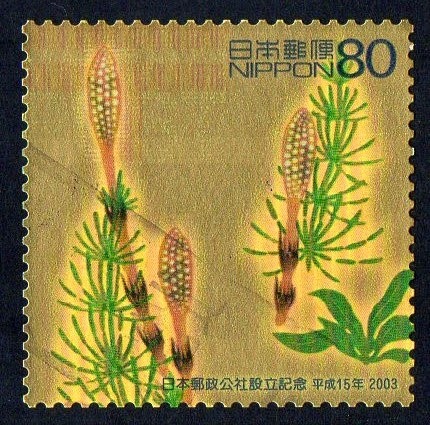 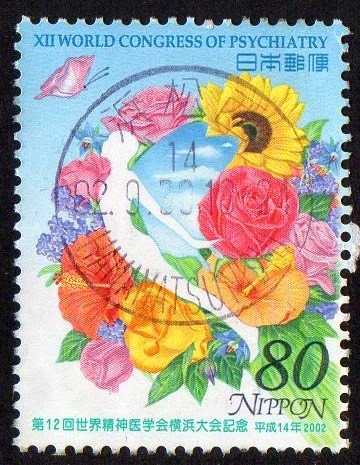 these are Prefecture Stamps.. they are really beautiful and I must highlight that this particular branch of Japanese Philately is a "Paradise" for a Flower stamps Collector...they appear in almost every stamp and we always finish thinking "What a beautiful Country..!!..." 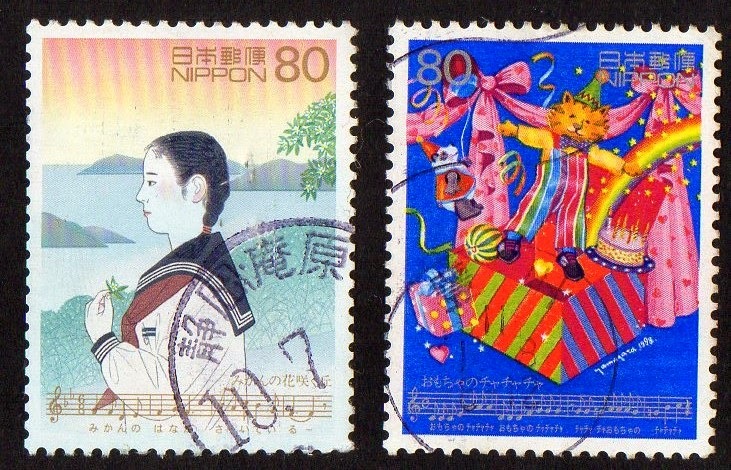 [Left] from a series (10) 2003 "Inauguration of Japan Post (public postal corporation)"
[Right] from aseries (2)+MS 1991 "Philatelic Week (120th Anniv. 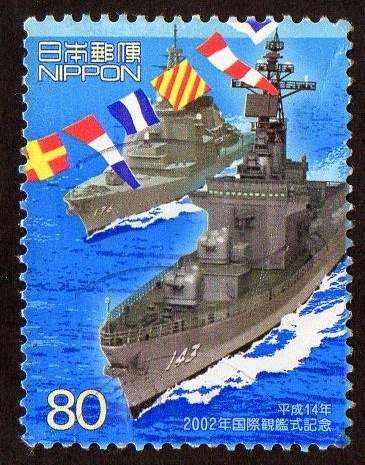 First Japanese Stamps)"
[Left] Complete series 2002 " Fleet Review"
[Right] complete series 1999 "100 Years of Japanese Emigration to Peru"
[Left] from a series (2) 1988 "International Correspondence Week"
[Right] Complete series 1988 "43rd National Athletic Meeting, Kyoto"
[Left] Complete series 2002 "12th World Psychiatry Congress." 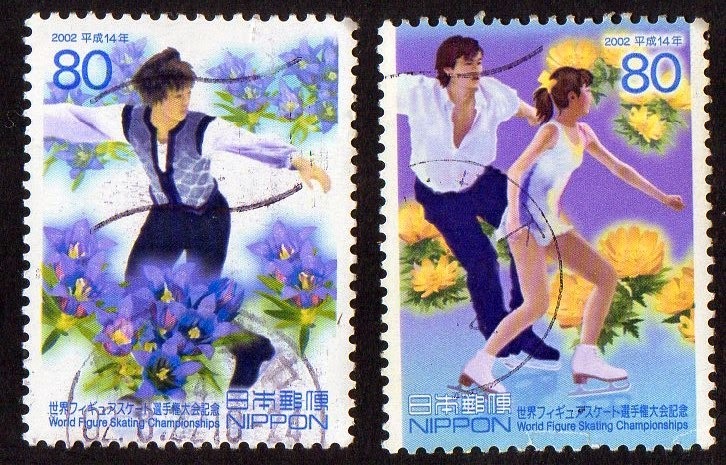 [Right] Complete series 2002 " 50th Anniv of Japan-U.S.A. Fulbright Exchange Programme"
Complete Series 2002 " World Figure Skating Championships, Nagano"
Complete series 1999 "Centenary of Patent Attorney System"